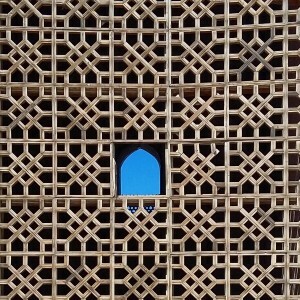 I recently made a detour from Bishkek to visit the fantastic Yasawi Mausoleum in the southern Kazkh town of Turkestan. 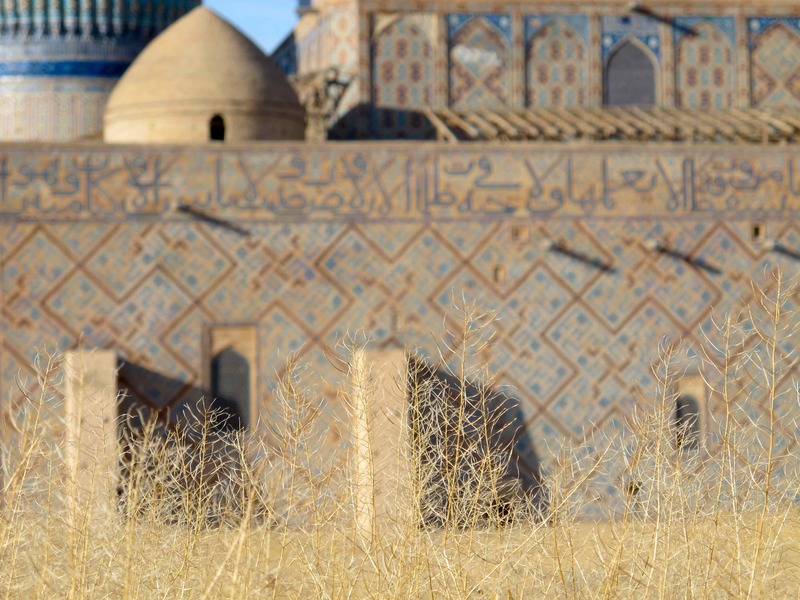 Even for history and architecture buffs visiting Central Asia, this 14th-century structure hasn’t always been on the travel itinerary. 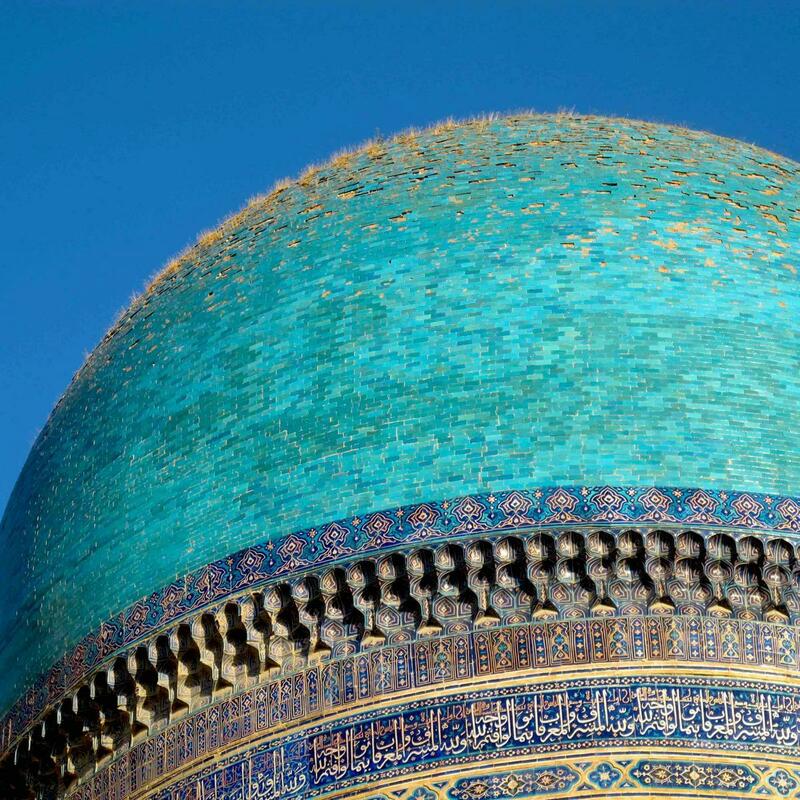 The mausoleum sits 300 kilometers north of Tashkent and is the sole example of Timurid architecture in Kazakhstan. 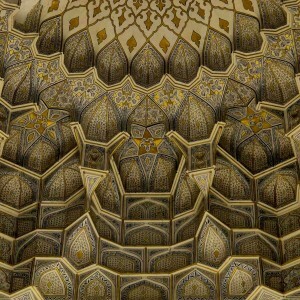 But it’s also among the oldest and best-preserved structures of its kind. 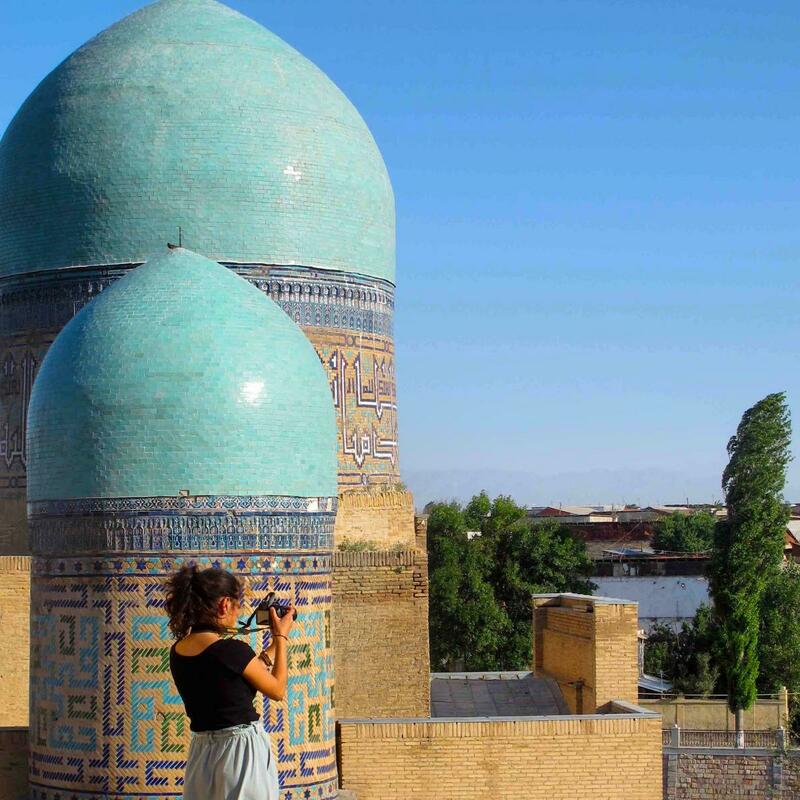 For visitors to Kazakhstan, traipsing out to Turkestan offers a unique opportunity to see centuries-old Islamic architecture, and it’s a no-brainer itinerary item for history buffs or backpackers in Central Asia who want to get off the beaten path and have something beautiful all to themselves. 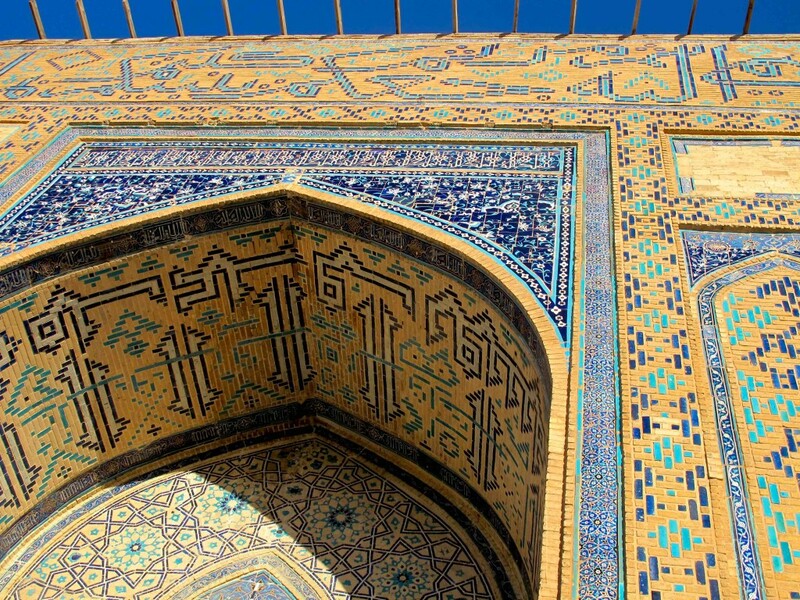 The Yasawi Mausoleum isn’t considered the pinnacle of Timurid architecture (those buildings are in Uzbekistan), but it’s widely considered the start of Timurid architecture. Commissioned in 1389, it kicked off an aesthetic that dominated Central Asia for two centuries and is still visible today as far as Turkey. 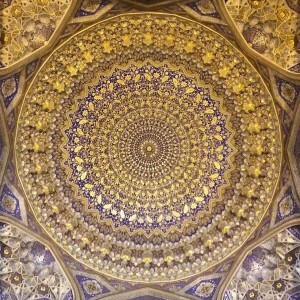 As an architectural style it not only remains emblematic of Central Asian Islamic art but also links the Persian and Mughal aesthetics that preceded and followed it. 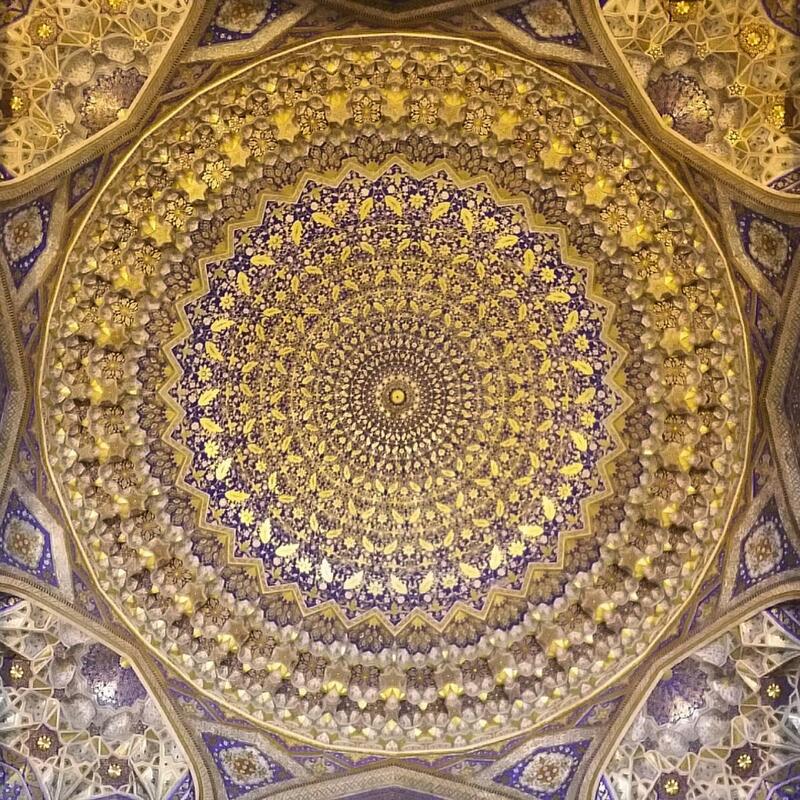 This mausoleum was built for Khoja Ahmed Yasawi, a Sufi poet, philosopher, and political figure. 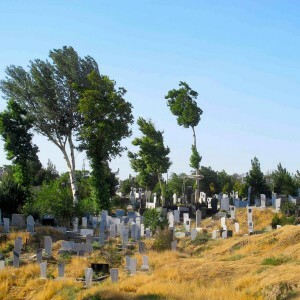 Yasawi lived in the 12th century and was roughly a contemporary of Rumi (the most famous of Sufi mystics) who hailed from a region just slightly south of Yasawi’s home. 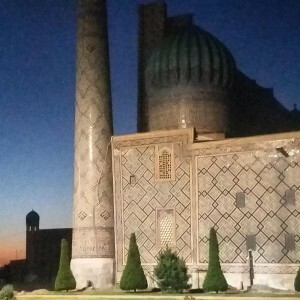 His tomb was already a place of worship when the great Central Asian conqueror Timur came to power, but Timur’s money and power translated the material side of Yasawi’s religious import into something even more epic. 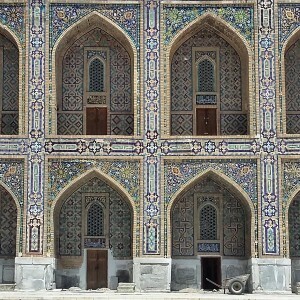 Timurid architectural owes its namesake to Timer, also known as Tamerlane. 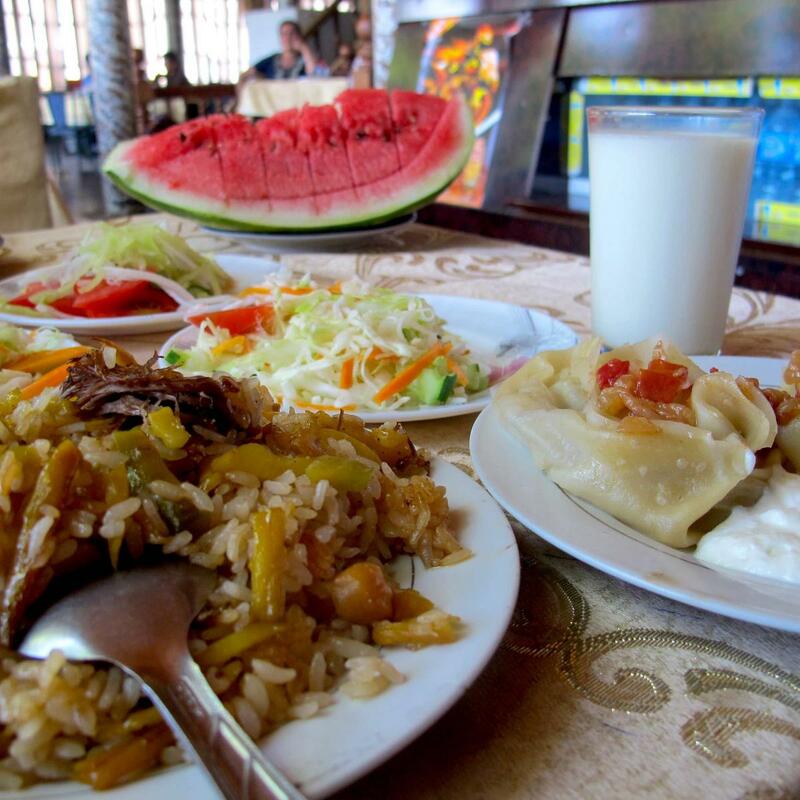 Although he wasn’t descended from Genghis Khan, Timur was the last of a line of great Turco-Mongol conquerors to emerge from the Central Asian steppe. At the height of his power, Timur defeated the Islamic empires of Egypt, Syria, Turkey and Delhi (in other words, dude was a real badass). The eventual decline of Timur’s dynasty coincides somewhat with the decline of Central Asian power, but his influence lived on elsewhere. 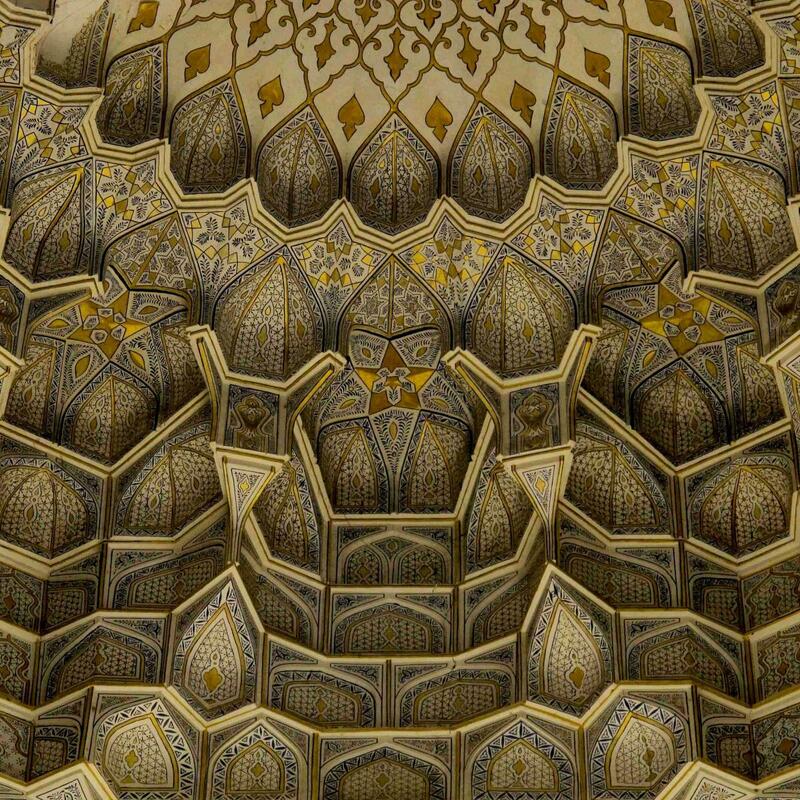 Among Timur’s descendants was Babur, founder of the Mughal Empire in India, whose dynasty took the Timurid aesthetic even further and eventually gave birth to the Taj Mahal. 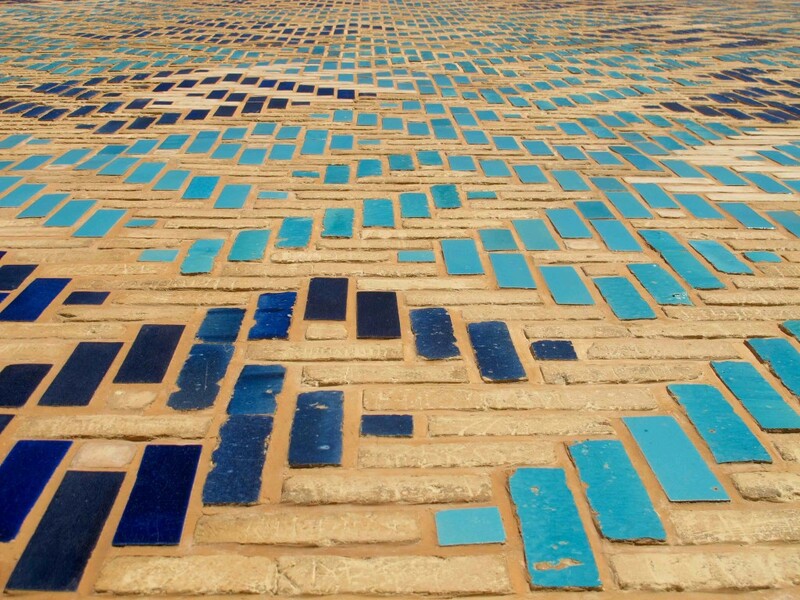 The Timurid style often consists of turquoise and blue tiles in geometric patterns, decorating tan structures that often resemble the rocky, dry landscapes that surround them. 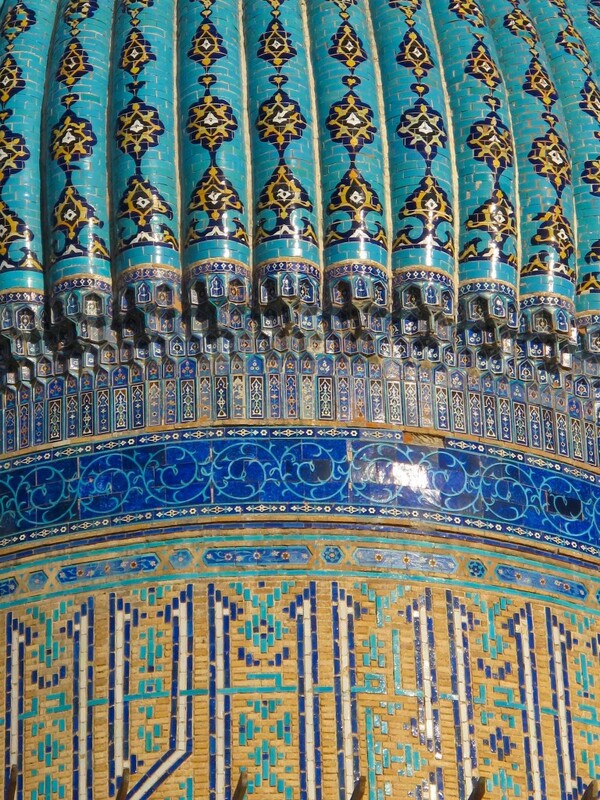 This close-up of the mausoleum shows one of the bulbous, turquoise domes common to Timurid structures. 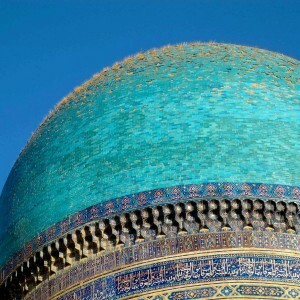 The Yasawi Mausoleum still claims the title to the largest brick dome in Central Asia. 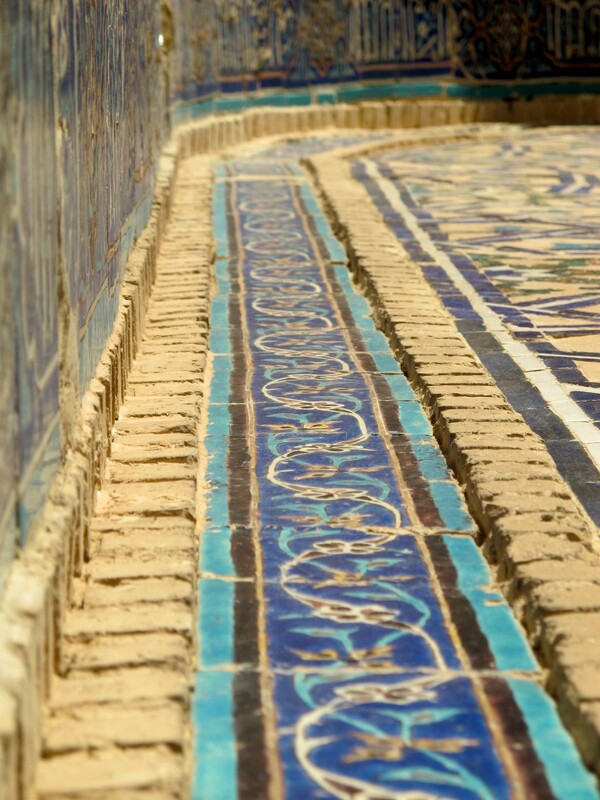 Mosaics and intricate glazed tiling and brickwork typify the exterior of these buildings. I had the place nearly to myself and had fun taking an absurd number of photos of the building from every which angle. 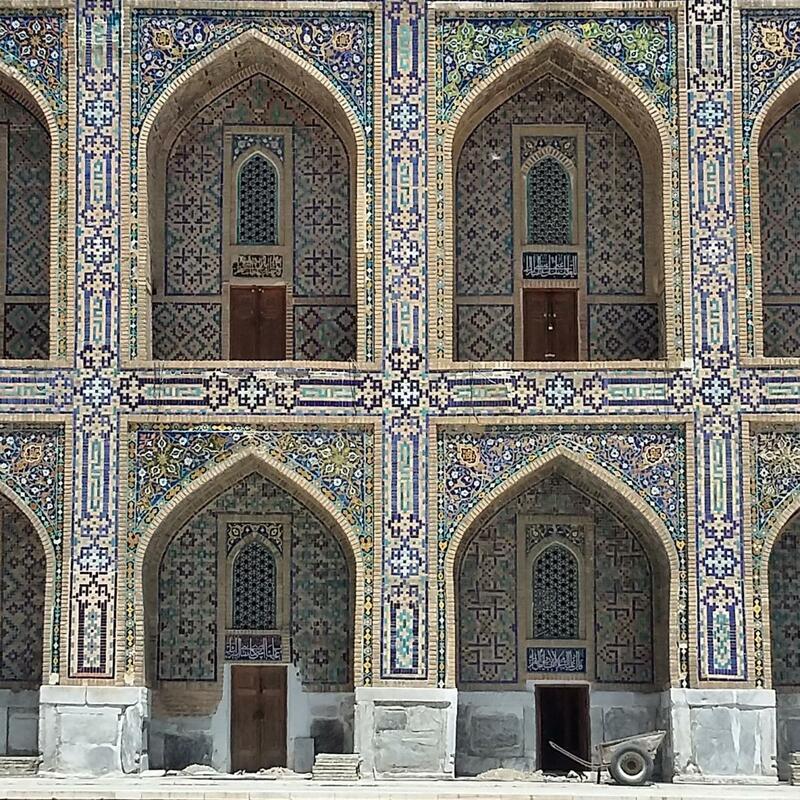 The Timurid architecture is a large part of why I wanted to visit Central Asia, and the Yasawi mausoleum remains one of the best preserved examples (with the least restoration) of all the Timurid buildings. 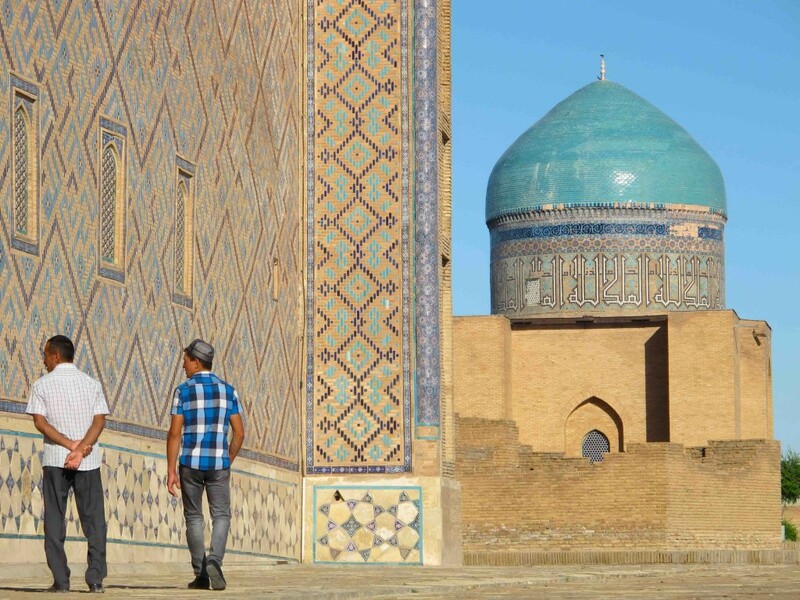 Personally, when I look at Timurid architecture I see a mingling of earth and sky (tan and blue), two elements well-represented in this part of the world. But who am I kidding, at other times it just reminds me of Space Invaders or Tetris. 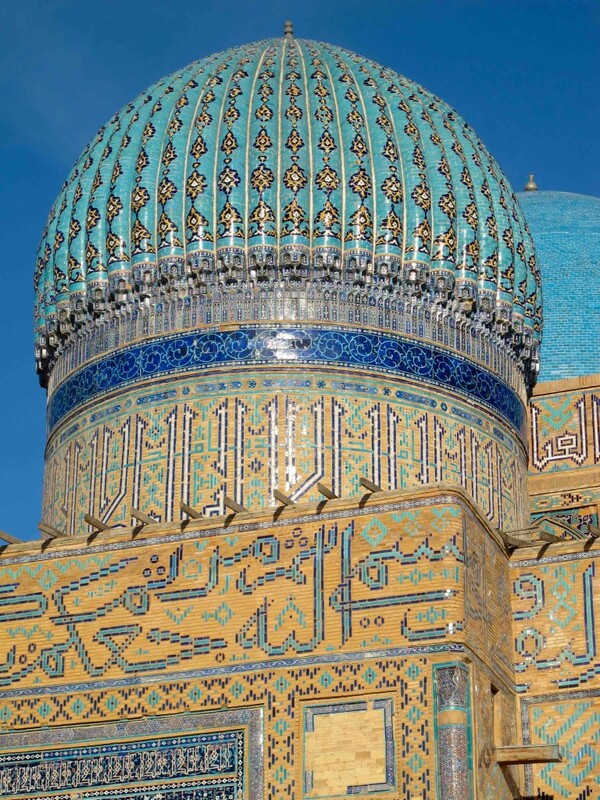 The Yasawi Mausoleum is still an important pilgrimage destination for Muslims in Kazakhstan. 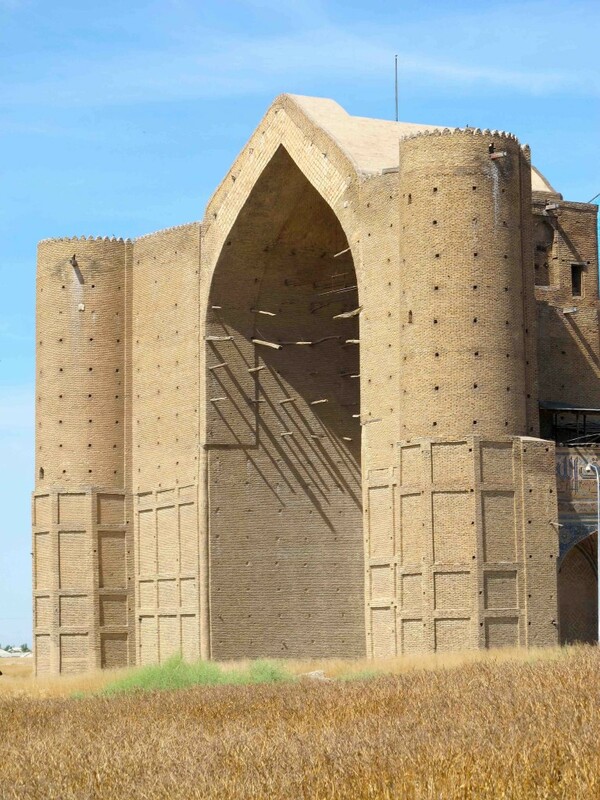 Visitors increased as the Kazakh Khanate that displaced Timur’s successors built the town of Turkestan around the mausoleum. 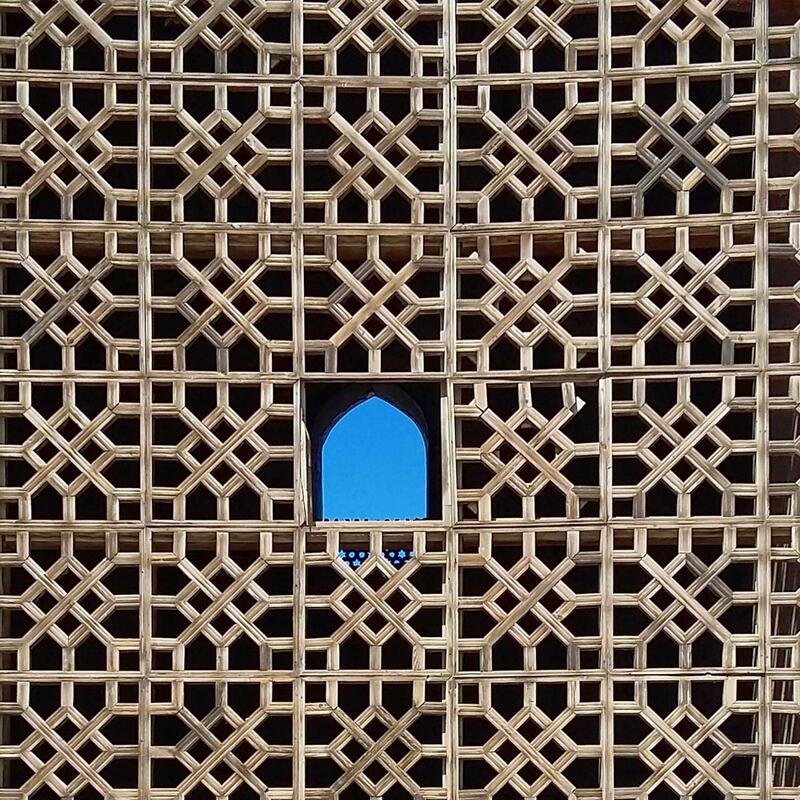 During my visit I saw a number of (mostly old) men and women walk the perimeter of the building tracing the surface with their fingers while praying. 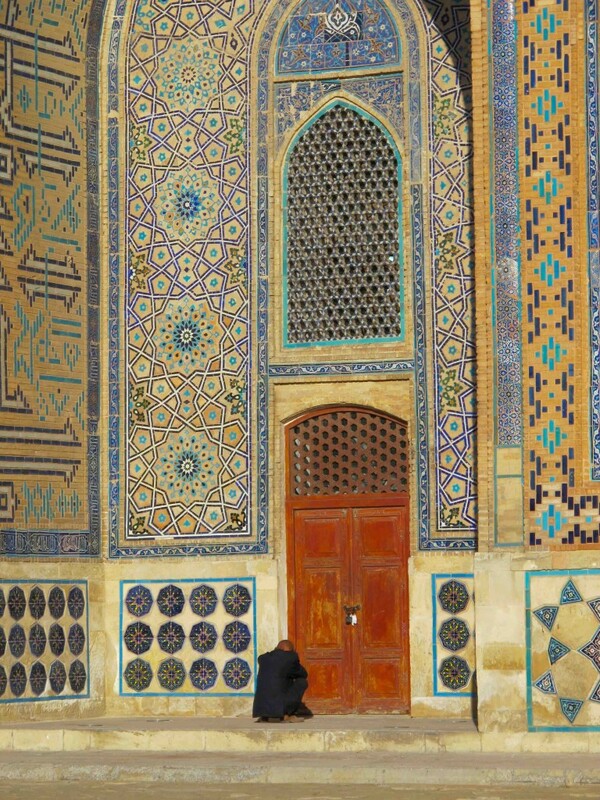 They would stop and kneel before the great door at the back of the building, outside Yasaui’s tomb, and sit praying before continuing on again. 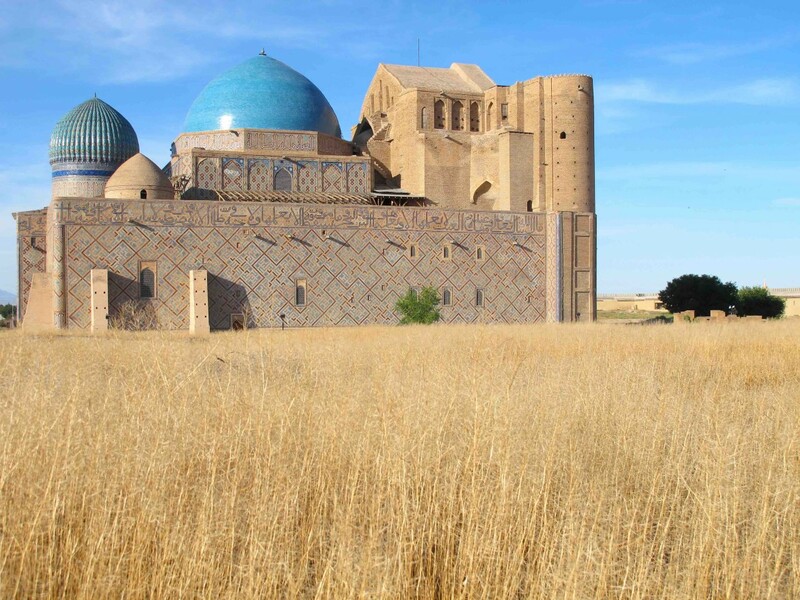 Nonetheless, the Yasawi Mausoleum remains one of the least touristed remnants of Timurid times. I visited it twice during an overnight stay in Turkestan and there were hardly any people at the mausoleum (and no obvious western tourists). Previously it might have been an costly detour from Bishkek or even Tashkent, but with Kazakhstan recently beginning to offer visa-free entry to nationals from a number of countries, it should become an essential stop on any tour of Central Asia’s architectural heritage. Pictured here is the entrance to the mausoleum, which is situated on the edge town. The building’s orange and blue colors are set on fire by the morning and late afternoon sun and framed by clear blue sky and fields of tall, brown grass.